If you are reading this, there is a good chance you’re a wine enthusiast, but might not know the best way to store your wine to keep it tasting its best. Storing wine, whether for the short or long term, may never have entered your thought processes. Or maybe you are already keeping wine stored and it’s sitting on your closet floor in the corner of the basement. Either way, perhaps you have found yourself getting more interested in keeping wine on hand in larger quantities. It goes without saying that keeping wine on hand certainly beats running out to store or the grocer whenever the urge for a glass hits you. You might even be thinking about buying wine as an investment, which means holding wine in storage, sometimes for years. Wine does not like heat; anything above 70° Fahrenheit will be problematic for your wine. 55° Fahrenheit, however, is the ideal temperature in which your wine should be stored. Humidity is also important and the proper humidity keeps the cork from drying out and letting oxygen sneak into the bottle. Additionally, oxygen will oxidize a wine, similar to what it will do to a peeled apple. While a brown apple is unattractive, it is still edible. An oxidized wine, on the other hand, is undrinkable. Yuck! Rob and Lori are pictured here visiting a wine cave in Spain where various wines including Cava and is stored cool and aged before shipping to the local markets for consumption. This cave has an area decorated with painting and serving cheeses for tastings. Think of your bottle of wine like you would a vampire. Yes, wine hates sunlight and pretty much for the same reason a vampire would. Light, particularly UV light, prematurely ages wine. White wines are more susceptible than reds, but reds will fall victim to UV light as well. In fact, the reason wine is sold in colored bottles is because the colored glass acts like sunglasses, and filters the UV light out. Why would it matter if you shook your wine bottle? It matters for two reasons: first, too much shaking can prematurely age your wine. Second, if the wine is a red, sediment gets disturbed from the bottom and distributed around the bottle. This results in a glass of grit instead of a nice glass of wine. There are two good reasons for storing wine on its side: the first is that storing the bottle this way keeps the cork in contact with the wine and this keeps the cork from drying out and shrinking. A dry cork allows oxygen to get in and compromises the wine, which ruins the quality of the wine for you to enjoy. Second, storing wine horizontally saves space, allowing you to keep more bottles in a smaller space. Knowing the basics of why it is important to store your wine and how it is properly done can help you figure out what type of storage you will need and where in your home your wine can be stored. 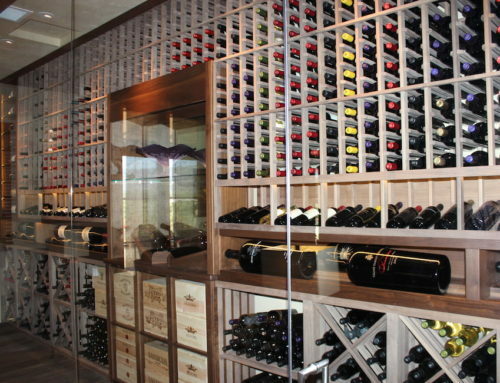 Serving the greater Dallas and Fort Worth, Texas area, Fainting Goat Wine Cellars specializes in providing world-class, custom installation to create the perfect space for your wine. They go far beyond that, however, with their unique design and attention to detail on each and every wine cellar.